Wow, what a fall it's been around here! We sold our home back in September and moved into a new home at the end of October and life has been a blur since! Most of the boxes have been at least opened and we are working through all the details of setting up a new home as well as figuring out the commute into Cambridge MA. Needless to say, fishing has taken a back seat while we sort things out BUT we did need to pick up my daughter from college in PA and that meant a quick trip to the Yellow Breeches. My PA friends tell me it was been a rough fall for them with all the rain and flooding. When I've fished the Breeches in years past, I could always find a few fish even in December but this year the fish were few a far between. The afternoon was pleasantly warm with the sun making it feel like early fall. It was just so wonderful to be out in the warm air with the sun shining that the lack of activity really didn't matter all that much. It was just nice to be out on a pretty stretch of water with my 3wt in hand standing in some moving water. The midges were enjoying the warm air too and quite a few were in the air. It wasn't until late in the afternoon that I connected with the first and only fish of the day, a decent holdover brown that took a black zibra midge. I probably won't have the chance to fish again until the new year, so this late inning brown will probably be the last fish of 2018. This next year should be a year of settling in to our new location and doing some exploring now that the move is behind us. I am sure I'll still head back to CT to fish some of my favorite water back there and there will be trips to the Adirondacks as well. I hope you all are taking the opportunity to enjoy this fall. This is my favorite time of year in New England and I am trying to take advantage of it before the business of the coming move takes over. The rain continues to come and the streams are as full as I’ve seen them in a long time. I haven’t seen many of the red maples turning but I am seeing the leaves on the ground. The last of the late summer New York asters can still be seen but a recent cold snap has left very few behind and the male brook trout are sporting brilliant orange bellies, dark throats, and kyped jaws. 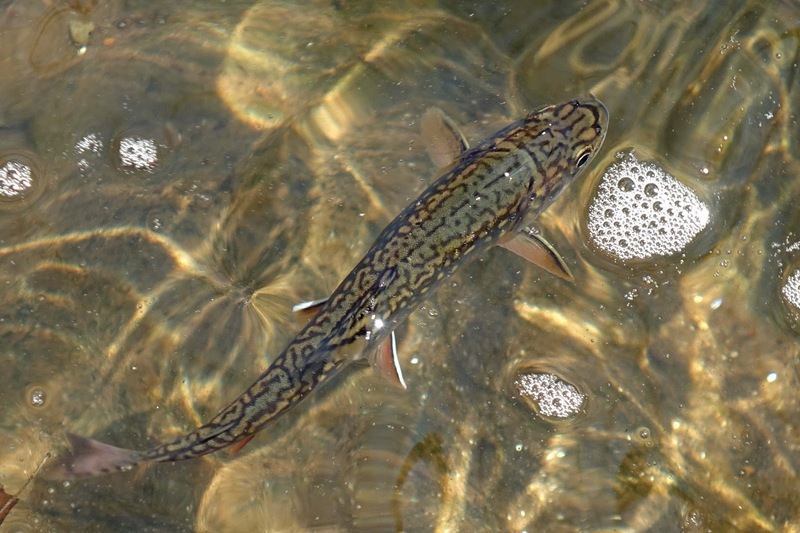 Even though there is a lot of water moving through the small streams the brook trout are still eager to rise a well presented dry fly. As the fall progresses, the fish rarely let an opportunity for food pass overhead. I did fish a dry dropper for a little but cut the nymph off after it was pretty obvious that fish were willing to aggressively rise to a large dry like an Ausable Bomber. Occasionally a fish would sail over the bomber signaling it’s disapproval of my offering but plenty were willing to take the Bomber without a second thought, some rising 2-3 times to the same fly even after briefly being stung by the hook. 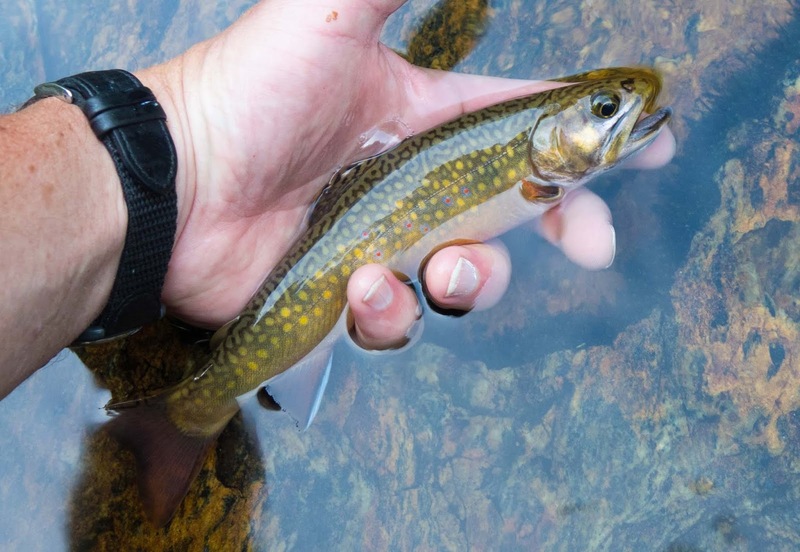 In addition to the brook trout's beauty, their aggressiveness to take a dry and the spirited fight that these small fish display are a few of their endearing traits. I ended up fishing upstream with the Bomber and then switching to an Adams/Wulff on the way down and catching some of the fish I missed on the first pass. Forget the football games and get out there and enjoy the season before it’s a distant memory. The signs of fall are everywhere in the woodlands now. The leaves are turning yellow, the reds and oranges will soon dominate the landscape. The lush green ferns of summer have turned golden as if to echo the changes in the canopy above. 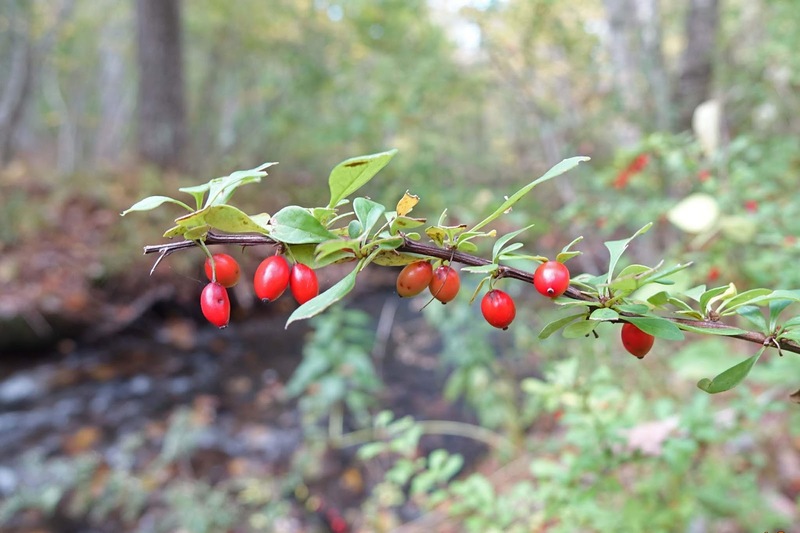 The steady rains of late summer have continued and the streams are full and flowing in full strength, adding their voices to the symphony of color that is fall in New England. Even the air has that distinctive smell of fall. I was honestly surprised by how full the brook was and wondered whether a dry was going to be effective. I did have a couple smaller fish slash at the adams/wulff variation I had used previously. I decided a dry dropper was a better choice so switched to a larger Ausable Bomber with a lighting bug nymph as the dropper, thinking that a bright, olive-type nymph was a good choice for fall. A lot of trees were down from the summer storms making delivering the pair of flies into various seams and undercuts a bit more challenging then usual but such is small stream fishing. Sometimes it's all about getting into the right position to guide the flies gently downstream into the right current seam. Sometimes this involves perching on a rock midstream and using a bow and arrow cast to flip the flies alongside the base of an overhanging tree and with a little patience mending the line you can get the flies to drift right along the base of that tree. On this particular October day, a fish rose from under that tree and crushed the Bomber. 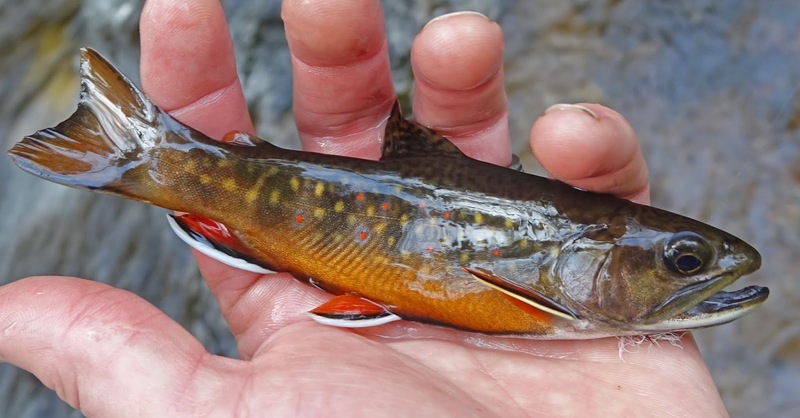 I saw a red flash and thought I had hooked a small rainbow but after a brief struggle I was holding one of the most gorgeous brook trout I've seen in some time. The deep orange underside was indicative of a fine male getting ready to spawn. The colors on this fish was stunning and I was so disappointed that during my fumbling to get my camera ready and keep the fish in the water, it managed to get back under that tree in a flash. I continued to fish the dry-dropper for the remaining hours of daylight until dusk began to envelope the forest. Hiking out in the near darkness, I was thankful for the opportunity to enjoy a day afield in my favorite season of the year. I hope each of you are able to enjoy these October days as well! Tiny nymphs in high water? Central PA has been getting an awful lot of rain this summer. My daughter’s college, on the banks of the Yellow Breeches, has been warning students to stay away from the river, and this weekend I saw why! While there was no foaming white water like you see in the spring in the mountains, one can’t help but feel small at the site of a heavy mass of water moving along in such a way as to overrun anything in its path. Not a place to wade into if you had any sense about you. About the only option to do a little fishing after a quick visit was to try "The run" over in Boiling Springs. The run is typically an intimate tributary of the Yellow Breeches where water from a spring feed pond flows down a short run to join the main stem of the river. 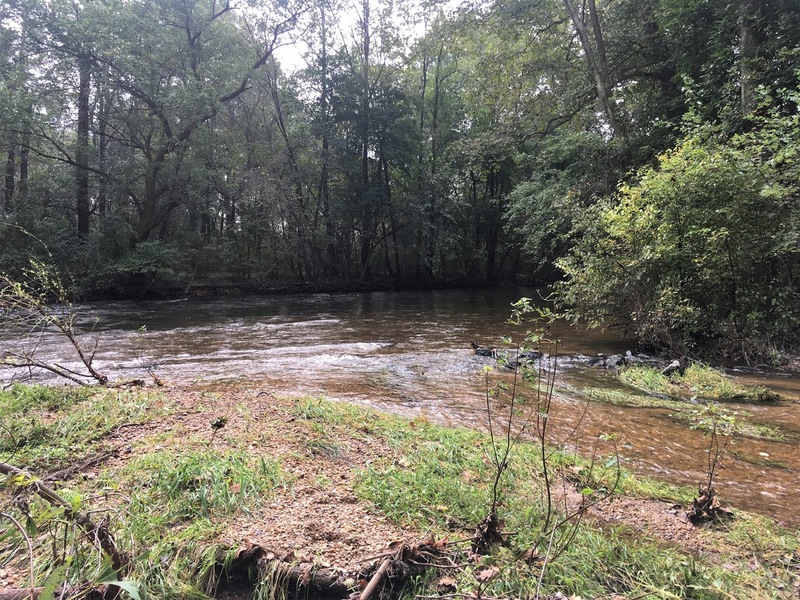 The Cumberland Country Trout Unlimited chapter has been doing habitat improvement work there and their efforts have created a lovely stretch of water. I had hoped that the protected nature of the run would render it more fish-able under the conditions but even here there was more water moving through than I’ve seen since I started visiting after my daughter first started college. I had the place entirely to myself which probably tells you more about the conditions that anything else since this is a heavily fished area. The water was as crystal clear as it typically is so I thought it was worth fishing for the couple hours before heading home. On spot that I typically find a good number of fish had too much water moving through for the fish to find any refuge. I tried a couple tiny nymphs and added plenty of shot to slow things down. I had one brief hookup before moving on to find someplace where the current was more moderate. Most of the fish I’ve caught in the run have taken a #20 nymph or midge so it was a little odd fishing such small flies with enough small shot to keep them where they needed to be but I did manage to hook a rainbow and a feisty brown that popped off at the net. I’ve certainly had better mornings in the run, but I was still pleased to have hooked a few fish under the circumstances. I guess you can fish tiny nymphs in high water! It's been a hectic and stressful summer around here but the good news its that we have a buyer for our home and managed to find a new home in MA. The final details are being worked out but the plan is to be our new home in late October. In the meantime, I hope to be able to fish a few of my favorite places before moving. When fall rolls around I usually fish a lot of Adams variations so I decided to tied a few Adams in the Wulff style and test them out. I used some woodchuck guard hairs for the tail, white calf tail for the wings, grey superfine dubbing, and brown and grizzly hackle. Yesterday, I took advantage of some fall like weather to fish one of my favorite small streams. The first test of the adams wulff was along the log pictured above. As the fly drifted along the last two feet of the log, a nice brook trout aggressively took it and headed back under the log. I was able to keep it from getting back under the log for a little before it managed to free itself. It wasn't too long before the wulff connected with another brook trout. Most of the fish caught were showing signs of getting ready to spawn. 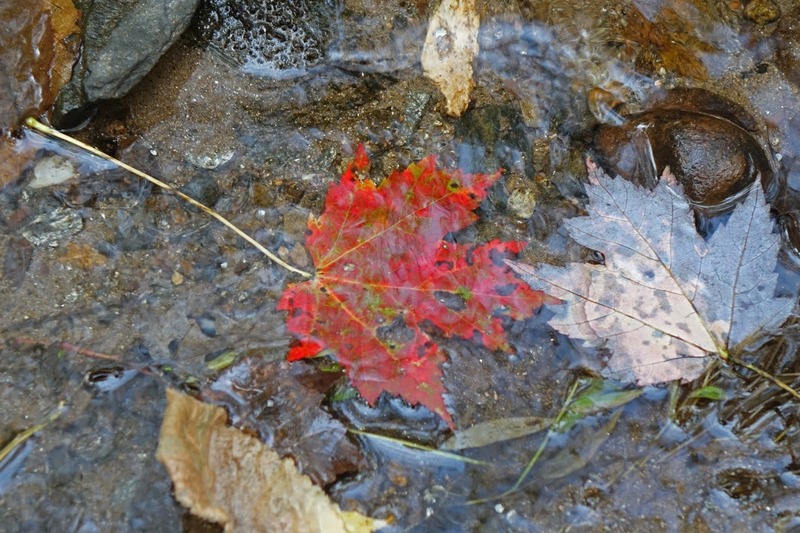 As I worked my way along the stream there was a definite sense that fall was in the air. The day was cool and overcast and the forest was taking on that early fall yellowish glow. The New York Asters were still evident. The adams wulff would be all that was needed. The best brook trout of the day went completely airborne and took the Wulff on the way down as it drifted through a gentle run! I don't know if I will get to fish this little stream very much in the future but today I enjoyed walking along it's banks once again during on of my favorite time of year. We are getting close to having our home ready for sale so I did manage to take a couple short breaks from work this last week. It’s been a few months since I last fished the Farmington so I’ve been a little out of touch with what’s going on up there but it’s icy waters were a welcome change from all the heat and humidity around home. The first evening, I was joined by a young deer who wasn’t all that concerned with me. By the time I had my camera ready, she was a ways off. I started the early evening off nypmhing my favorite pheasant tail and caddis puppa combination with no interest. I had noticed a few isonychia, so I switched over to a dry dropper combination (a larger parachute adams with a #20 rainbow warrior). I don’t know why I selected the rainbow warrior but on the first drift a brown took the small nymph but quickly shook the hook. Taking the clue, I tried a couple of small nypmhs on my tight line rig and found a half dozen willing to take the small warrior but like the first fish, all but one wild brown managed to toss the hook. I did miss another wild brown on the parachute adams and landed one nice wild brook trout on that same dry later in the evening before I headed home. It’s always nice to find some wild fish on the river and it was a pleasant few hours to be outside breathing something other than fresh paint. After missing quite a few fish on the previous outing, I was looking for some redemption. A few days later, there was another break in the work and I decided to try again. There were a good number of fisherman out and even my generally overlooked spot had a pair of fisherman that most likely had worked through the water I was hoping to fish and another gentlemen in a run below that. Still, I thought I could find a couple fish and took up the challenge of fishing behind another pair of fisherman. Recent rains had the river up and a little off color so I tried a small frechie along with the rainbow warrior. Both flies connected with fish this particular afternoon and I only dropped one. 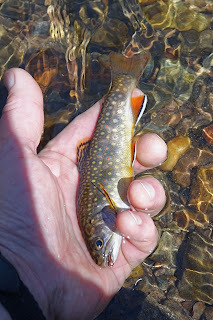 I was pretty pleased to have landed a couple solid browns, a couple of smaller wild browns and a small brookie all while fishing previously worked water. Later in the evening I headed upriver to see if the small sulfurs were still coming off. As the sun set the sulfurs came off in good numbers but few fish were noticing. I did find a group of wild brook trout that were taking the small bugs along the banks under the cover of some limbs brought down my active beavers. A small usual connected with the three I saw rising before things got quiet at dusk. Hope you all have been getting some fishing in this summer! Tight lines! I am re-posting a short piece that my late friend Pete sent me a while back. Pete was master at fishing a fly we jokingly referred to as "Pete's Fancy". I don't know how many of them I tied for him but he could catch fish in any stream at any time of the year with a simple bead head pheasant tail nymph with a couple turns of partridge hackle behind the bead. I hope you find it as informative as it was therapeutic for me to read again the words of a good friend. "I was asked to write a guest post by Mark, who dubbed me the Zen Master of the Pheasant Tail. While I don’t know if I am quite the Zen Master, I can tell you that the Soft Hackle Pheasant Tail has become one of my “go to” flies, and I have caught many, many trout using this fly. 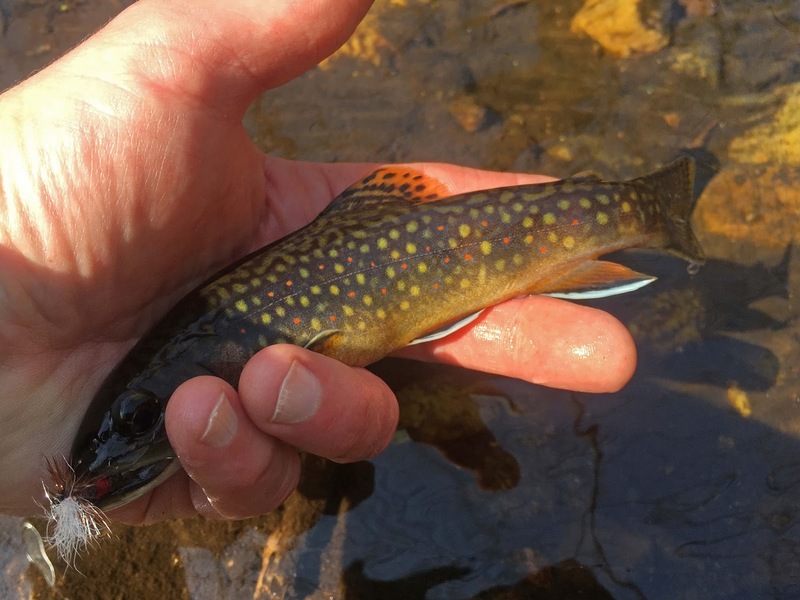 I have taken trout in every river that I have fished the Soft Hackle Peasant Tail, including small wild trout streams during December and January. It has been my “go to” fly particularly in the Farmington River. Mark and I have fished with several other fishermen from a forum that we all belong to and each one of these fine fly fishermen can attest to effectiveness of the venerable Soft Hackle Pheasant Tail." Here's a video if you are interested in tying a few! Last week I had the chance to spend a few days in the Adirondacks. With temperatures reaching into the upper 90’s in most New England, the Adirondack Mountains did not escape the heat wave as they often do. 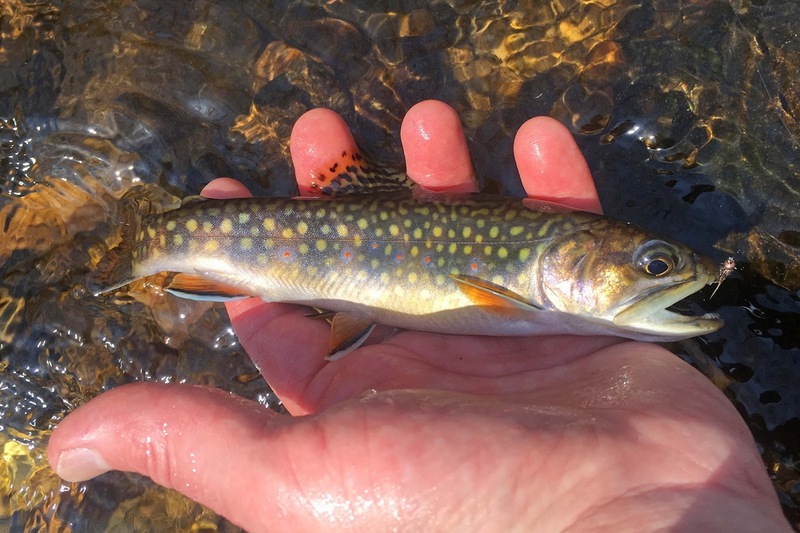 The heat coupled with dry summer conditions meant that most of the brooks I usually fish were too low and potentially too warm to fish but there is one that usually remains cold through the dry summer months. I was up before dawn to take advantage of the cooler morning air. 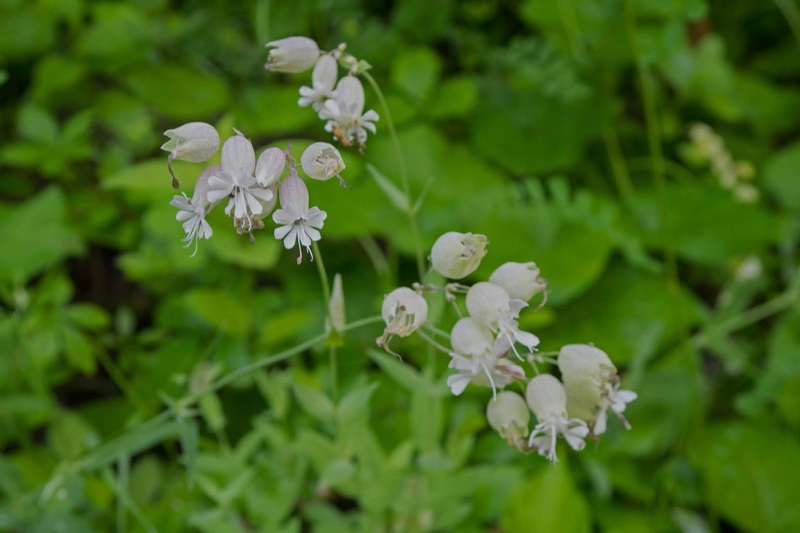 The cool night air had brought a heavy dew on the white compagnon, daisies, and chicory growing along the roadsides this time of year. 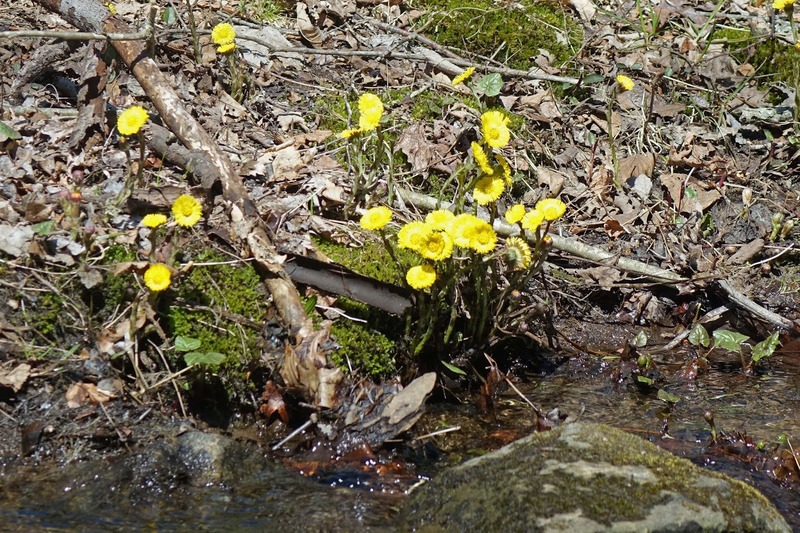 When I reached the brook, I could hear the gently tumbling water but the stream was low. A quick check of the water temperature, indicated it was in a safe range to fish. I fished a black foam ant in the heads of the small plunges and caught a few smaller brook trout. 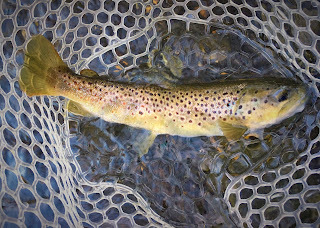 Switching to a larger tan caddis seemed to bring a few larger fish to the surface. 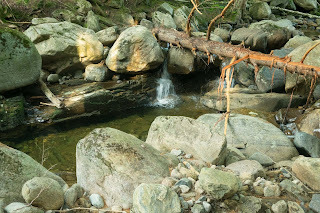 As I picked my way downstream along the boulder strewn brook, I approached a favorite shelf of exposed Canadian Shield. Along the shelf there is a break in the rock that forms an underwater ledge with some current running along it. I often find fish hanging close to the ledge. As the caddis floated along the ledge, I watched a nice brook trout rise, inspect the fly and turn away. 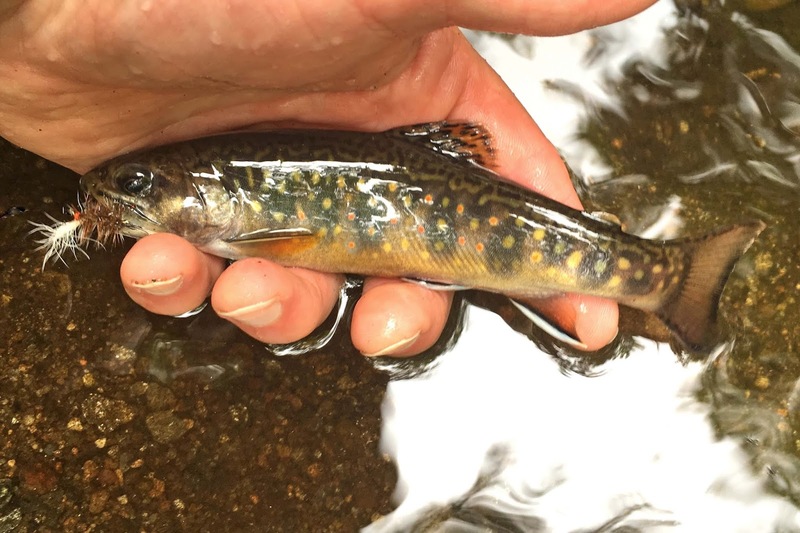 Most brook trout that I run across in these relatively sterile Adirondack streams don’t typically refuse a well presented fly so this was a bit puzzling. I waited a bit and then tried again, this time with no response. 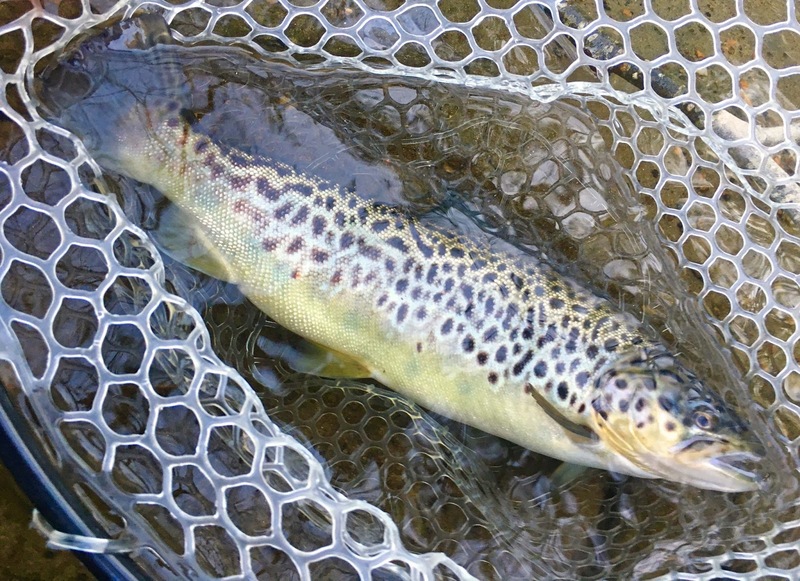 Switching to a foam ant, and then lighter colored usual, also failed to interest the trout. Reasoning that the fish had inspected a tan colored fly, I tied on an Ausuable Bomber and floated it along the ledge. 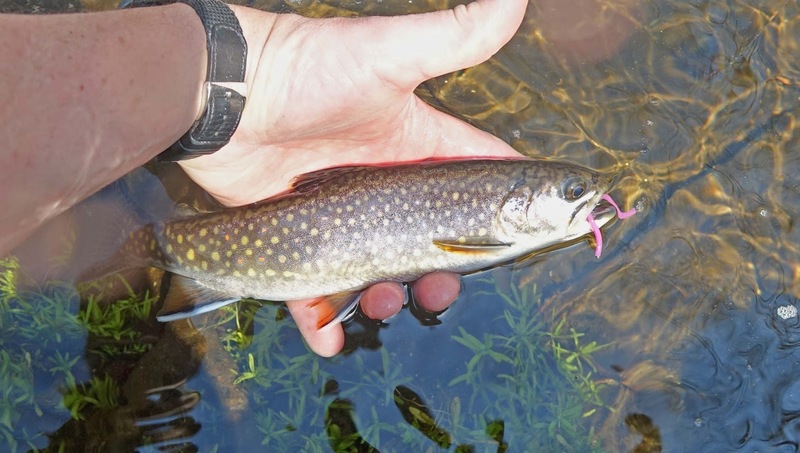 This time it rose and took the fly but the barbless hook didn’t hold and the brook trout headed back to the safety of the ledge. Not wanting to give up on nice fish, I waited some more and tried the bomber once again and was surprised that it rose once again. 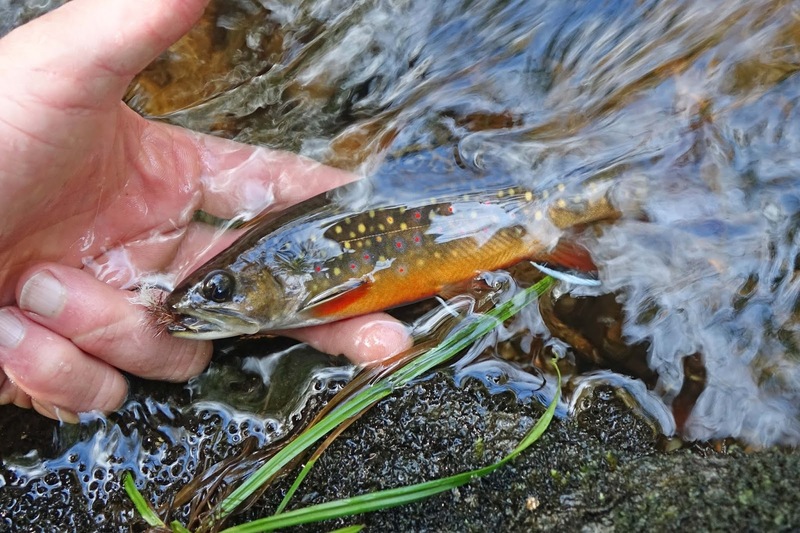 This time the hook held and I was soon holding a lightly colored Adirondack brook trout. You can see the exposed Canadian Shield in the background. I find the fish in this particular stream are generally lighter in color, this may be due to lack of tannin in the water (often found in the Adirondacks) and the lighter stream bed formed by this rock. I continued to fish until the morning air started to bear the heat of the coming day and then quit. I would have like to fish more while we in the mountains but the temperature and the dry conditions didn’t allow that but I was thankful for one morning to fish in the mountains we love. Last week my friend Pete (TROUT1) passed away after a long bout with cancer. I had a chance to visit with him before he passed and we laughed about the adventures we had together over the years. Despite everything he was going through he always managed to have a positive attitude which is something I will always remember. I first met Pete after an email exchange during which he graciously offered to show me around a local stream that he had fished for years. That first meeting turned into a friendship that took us fishing small streams and larger rivers all over Pete’s home state of CT. Having spent his entire life in the same general area, he was wealth of information that he was gracious enough to freely share. I would have never started fishing the Farmington River without his encouragement and guidance and it was Pete that introduced me to tight line nymphing. Pete was an well rounded fly fisherman who was at home fishing dries, nymphing, or swinging streamers but he was a master of fishing wet flies. At Christmas time or his birthday I would tie him some of his favorite bead head pheasant tail soft hackles and he would proceed to catch more fish on the flies that I tied for him than I ever could. A fact that he would remind me of frequently. I will miss you friend! We've been working hard on our home but I needed a break. A solitary walk along a favorite woodland stream was just what was needed. 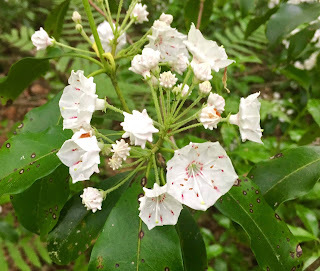 Air filled with the fragrance of multi-flora rose, mountain laurel starting to bloom, a hardwood forest alive with birdsong, the quiet of a lush canopy of green under cloudy, overcast skies; these are the elements of fishing these tiny waters that bring perspective, joy, and refreshment. Yes, the stream was alive with aggressive brook trout eager to attack a bomber multiple times but there was so much more to be sensed, enjoyed, and to be grateful for. I was still hoping to catch a decent afternoon hatch so Ben and I made plans to head up to the river a few days after my previous attempt and try a little further upriver. 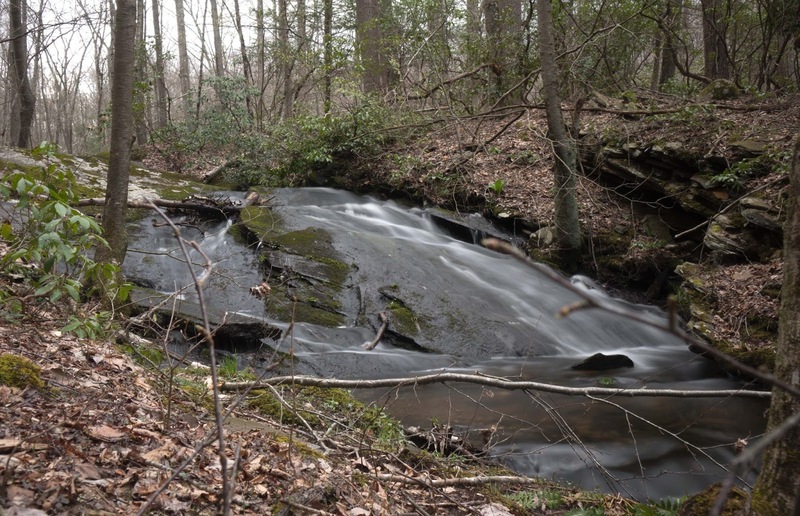 We arrived before things got started and I headed up into some riffles to do some nymphing. I found a couple of pockets with a few of the recently stocked survivor strain browns. They were easily identified being about 12 inches long with a bright green tag behind the right eye and a clipped adipose fin. It wasn’t long before I started to see the egg laying spinners being blown downriver and then the duns started hatching. A couple of guys were work the tail of the run so I opted to stay put and switched over to a dry fly rig. 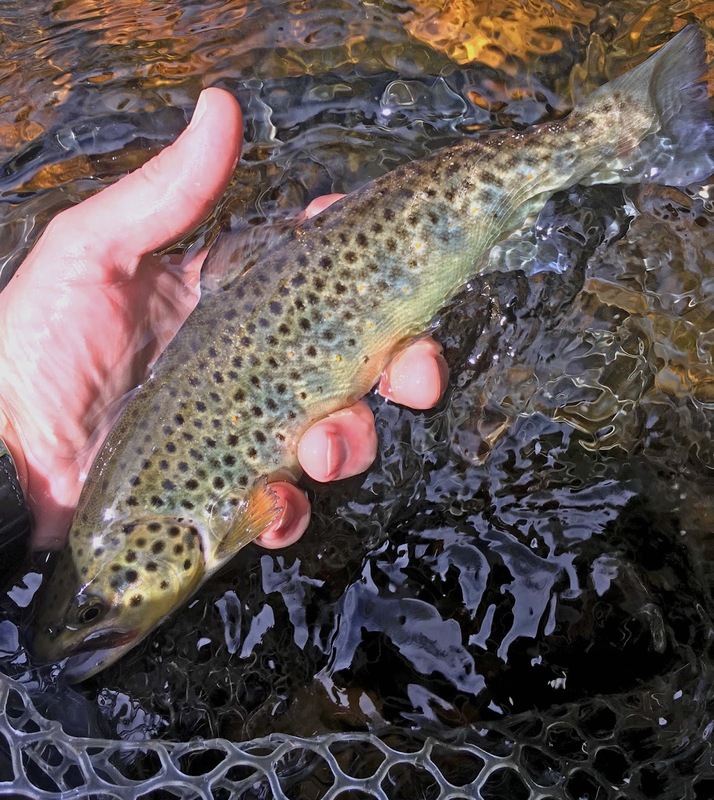 There were a few rises out of the main current, but fish were willing to take a dun drifted through the riffles even if there were no rises evident for as long as the hatch lasted. Even though the fish weren't big, I prefer fishing dries in pocket water vs slower water. 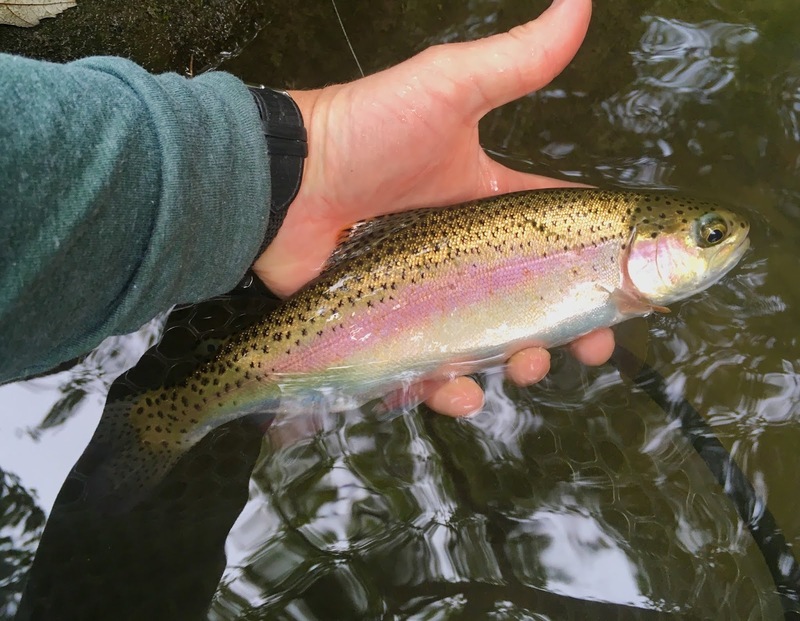 After the hatch wound down, I hiked to another stretch of the river and did a little more nymphing and landed another rainbow and a brown. All the fish I caught nymphing took a bright green caddis puppa. I never did find an effective second fly in my double nymph rig despite a good bit of switching around. We finished up the day fishing the spinner fall that evening and both did quite well with a egg laying spinner first and then a rusty spinner later. Early on I managed to find a pocket of wild browns of various sizes which is always nice to see. A few days later I was able to fish another spinner fall. I caught a couple nymphing the early part of the evening and then had fun evening sharing the tail of a pool with 3 other guys. Two of the guys I had met years before. I usually run into them during the hendrickson hatch year after year in this same location, the third I had met during my last two trips. Even though there were 4 of us fishing in a smaller area we all had rising fish to cast to and when the evening was done, one commented “that was very civilized!” It’s always a pleasure to share the river with friendly, considerate people, which is generally the case even on a heavily fished river like the Farmington. At this point, the hendrickson hatch is winding down and it’s time to dig in and get our home ready to sell and prepare for our relocation to the Boston area this fall. Needless to say things will be quiet around here for a while so I wanted to take the opportunity to wish all of you a wonderful summer. My second trip up to the Farmington was on a bright clear warm afternoon. As I surveyed some spots working my way up the river I spotted some hendricksons coming off and an area where there were some rising fish and only a couple of fisherman. The rises were mostly in the same spots but they occurring in water about 1-2 ft deep and the slower current made it difficult to get into position to cast without sending ripples. The fish seemed to notice when they were being approached as the rises would stop and then start in another area. Every time I would move the rises would move back to where I had just been. I did see a few fish take duns off the surface but when I looked carefully in the water, I couldn't believe what I was seeing. There were a dozen or more dark nymphs drifting in every square foot of water as far as I could see. After a couple hours of frustration, the hatch died off and things got quiet again. I was beginning to question my sanity waiting for spinner fall with the wind blowing as hard as it was. Almost ready to pack it in and count the day a loss, I saw a single solid rise right in front of me. I tried several hendrickson dries (comparadun and spinners) with no response and then I remembered a friend's advice - "when all else fails throw them something different". I looked in my box and the craziest thing I had with me was an Ausable Bomber. Wouldn't you know it, on the first drift a solid brown came up and nailed the Bomber. I couldn't believe it! While I was working on bringing it to the net I wondered if I had foul hooked it but it had inhaled the bomber like it was the last meal it would ever see. After seeing another lone rise further upstream, I cast the bomber, mostly out of curiosity, and sure enough the fish came up but I missed setting the hook. Who knows what the fish saw in the Bomber but by this time the wind had settled and the spinners were in the air. I started off with a size 12 but then switched to a size 14 rusty spinner and picked up a nice holdover brown. It was one of the survivor strain browns that are removed from the river as a large adult, taken back to the hatchery to breed, and returned to the river. From the red marking behind the left eye this one was released back into the river as an adult in 2017. It's always encouraging to see fish holding over well in the river. As darkness approached the fish were still rising but they were ignoring the #14 spinner. I suspect they were taking something smaller. It was a frustrating day to start but redemption came in the last hour. The Hendrickson hatch has finally made it to the Farmington River and last Sunday afternoon was my first chance to get up to river. It was a rainy, damp day, the sort of day that you don't usually see Hendricksons. I fished for a while in an faster run that dumps into a long deep pool. I thought I could nymph the faster water and if a hatch occurred, there might be rising fish in the pool below. The faster water produced a brown and a pair rainbows. 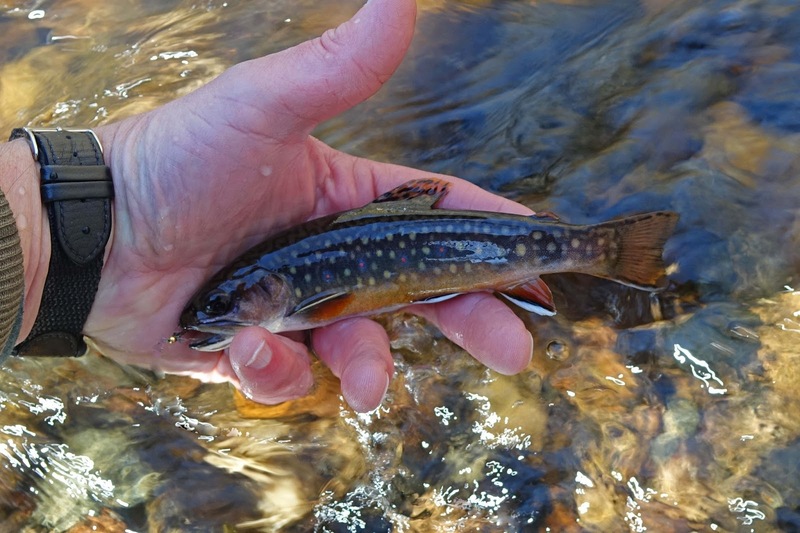 After spending a winter and spring chasing small wild brook trout, I had forgotten how strong the fish in the Farmington are and the first brown of the afternoon quickly reminded me. The highlight of the afternoon was an epic baetis hatch. It wasn't the hatch I had gone looking for but typical of a grey, rainy spring day. While the fish were largely ignoring the bugs, the swallows were all over them. I just sat back and watched. There were so many birds in the air at the same time, that I wondered how they didn't run into each other. I didn't dare cast a fly into the swirling, darting mass of birds for fear of injuring one. If you've ever watched the areobatic flight of swallows then you can imagine what it must have looked like! I finished up the afternoon checking out one more spot and picked up the last strong rainbow of the afternoon. In a future post on two, I'll have more to say about the Hendricksons. I’ve been interested in experimenting with long exposure photography for some time. After doing a little research to get familiar with filters and settings, I figured that I would need a neutral density filter and a 10stop filter seemed a good place to start for what I was interested in doing. The first opportunity that I had was an overcast afternoon, so I chose a small stream that I’ve been fishing with a nice waterfall. The brook trout were active and many were hooked on a bead head pheasant tail that I had dropped off a royal wulff dry. A few fish took the dry but the strongest fish hit the pheasant tail hard and then ran for the roots and undercuts and were able throw the hook. 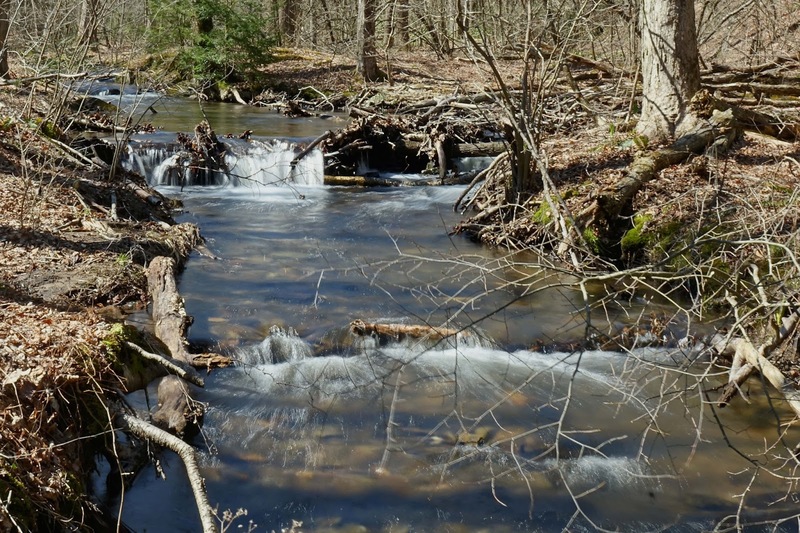 The late spring snow storms have left a lot of debris in and around this small stream making it difficult to get a fly to where the fish were and even more challenging bringing a feisty brook trout back out! I spent the last half hour experimenting with the camera and the filter. Other than the out of focus twig on the right side, I was pleased to get the effect on the water that I was looking for. The 10stop filter was a but much for the overcast day but it should work nicely in situations with more light or longer exposures. This first study gave me a little better understanding of the variables I will need to control when using the filter. One of pleasures of fly fishing in general and small stream fishing in particular is watching and observing all that surrounds. I continue to be fascinated with the natural world and how it is constantly changing and yet there are patterns and cycles that are repeated. Here in New England we are blessed with 4 distinct seasons that each have a unique beauty and I love to watch one transition into another. Some streams I will fish only in a particular season while others I will fish throughout the year. 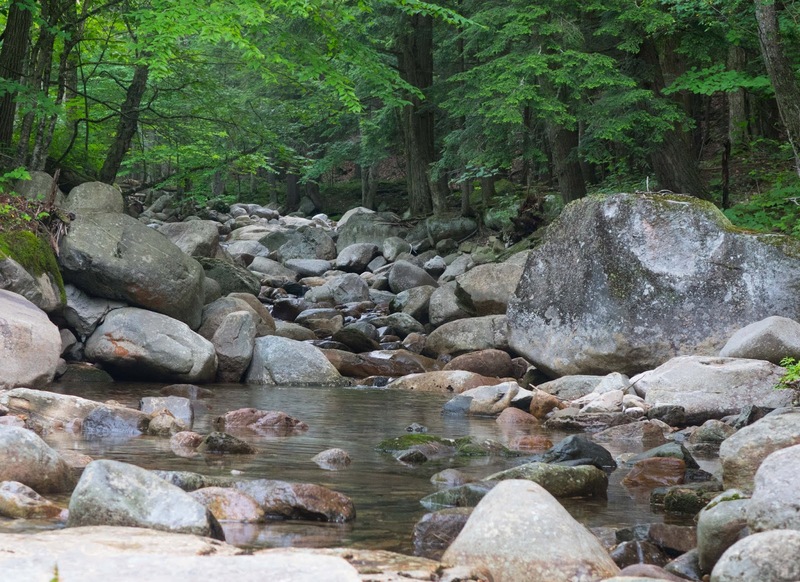 The streams I return to often are like a well worn pieces of clothing, familiar and comfortable. You get to know by experience what will be blooming and where the fish will be holding under various conditions. But that familiarity does not wear old. With each visit there is something new to observe, something unique to discover, if you are alert to little details such as how changes in the landscape indicate changes in the stream. Because nature runs in cycles, what is blooming on the forest floor will often be connected in some way to what insects are active and where trout will be holding as ground temperature is indicative of water temperature. My last visit to this particular stream was on a cold day in February when snow still covered the ground. While the early morning had a chill in the air, the spring-ward track of the sun was evident and there was a sense of new life that was about to enter. Heavy rains earlier in the week had filled the banks with water and the evidence of flooding was easily seen. 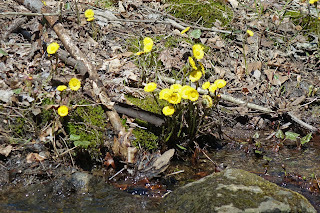 Buds were just starting to appear on the trees but the woods are still are clothed in the brown and grey of early spring with the exception of a few coltsfoot blooming on the southerly facing banks of the stream. The chilly early morning air and the heavier spring-like flow suggested the fish would be out of the main current and would probably not notice a dry fly floating on the surface so I rigged up a dry dropper rig with an easily seen royal wulff and a bead head pheasant tail with a couple turns of partridge trailed behind the dry. Hiking along the stream with the early morning sun reflecting off the moving water brought a bright pleasant warmth inside. After a winter that seemed to hold on long past it's time, a welcome change was in the air. I experimented with various dries and nymphs but my initial choice turned out to be the best combination and I enjoy a marvelous morning afield, leaving reassured that the brook trout have survived another winter and hopeful for even brighter days ahead. 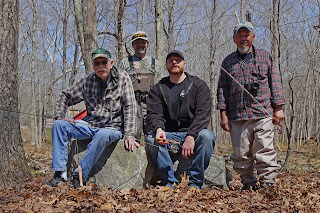 What amazing weather we had this year for the opening of trout season in CT. For those of us who love fishing smaller water for native trout, the opening day is day to get together with old friends to fish the small streams we love once again. Even though this spring has seemed like an endless February, the day dawned bright and warm and Alan and I enjoyed a fine morning. 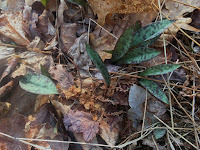 There were trout lilies everywhere just starting to pushing up through the leaf litter of last fall. We had arranged to meet Pete and Matt at around 10:30 a little further downstream so we moved on and enjoyed some coffee and muffins while we waited for them to arrive. They arrived soon afterward and we chatted for a while and sipped more coffee before heading off to fish. 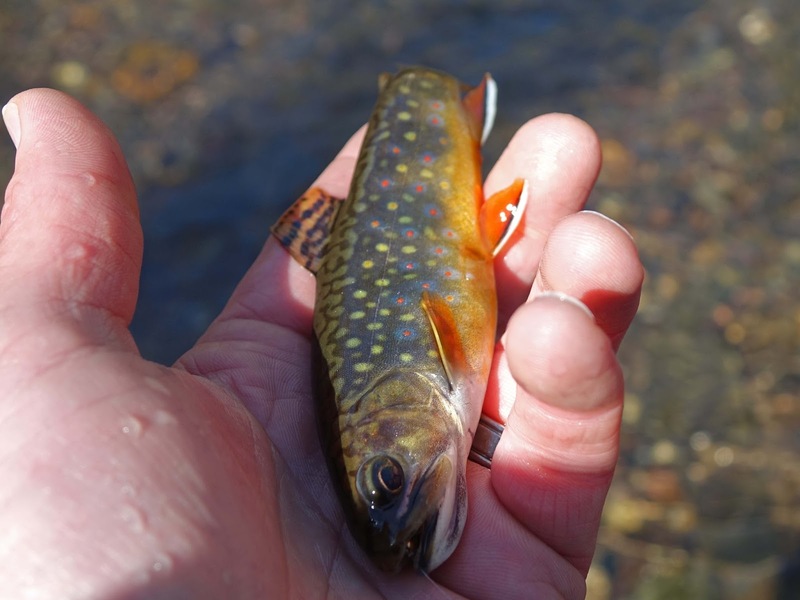 Alan was the first to raise a brook trout on the Hornberg he was fishing. After trying to coax it back to the fly he headed downstream and Pete and Matt headed up a small tributary that has treated us well in years past. I decided to send the dropper/dropper I was fishing through the run where Alan had raised a trout and connected with my first brook trout of the morning which took the pheasant tail dropper I was trailing behind a royal wulff. I decided to head a bit upstream and found a nice deep run to drift the dry dropper through. On the second or third pass I spotted the flank of a decent fish that must have turned on the pheasant tail. I replaced the dry dropper with a pink squirmy worm with a tungsten bead, thinking that a big meal might get some interest and sure enough the first drift produced the solid pull of a hefty brook trout that put up quite a fight in tight quarters. This one was a handful! After discussing potential options to see Pete land a wild brook trout, we moved to another stream. Pete and I tried a couple spots before we headed back to the car and said goodbye. I looked around a bit for Alan but decided to leave a note and headed upstream to find some more brook trout. 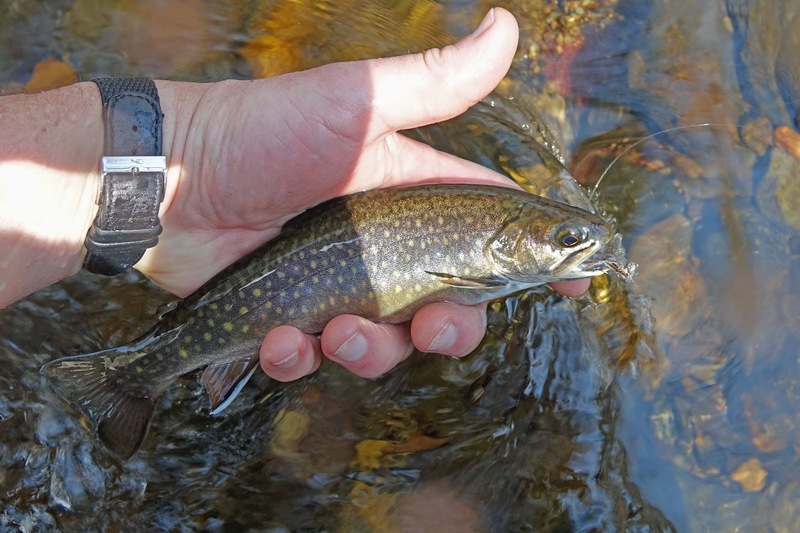 The warmth of the afternoon was getting the brook trout active and rising fish were starting to show themselves. 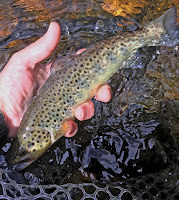 I continued to fish the dry dropper but later in the afternoon the fish were turning on the royal wulff more frequently. The recent late spring snowstorms had left a lot of limbs down in the woods and the small stream was quite choked with limbs and debris. I had to pass on many good looking spots simply because I just couldn't get a fly into them. The bright sun made a stealthy approach challenging and I saw more than a few dark shadows rocketing for cover but a few more gorgeous wild brook trout were brought to hand and released. What a great way to spend a spring day with good friends doing what we love together.